August 23, 2006 -- Want to get a sense of the growth industry the Katrina Cottage movement has become? Just Google the words. By August of 2006, you’d get more than 26,000 Web references to Katrina Cottages. Not bad for an idea born from a hurricane and a design workshop less than a year before. Katrina Cottages -- a family of designs for small-scale, quality-built houses worthy of storm zones -- were born from an assignment New Urbanist architect-planner Andrés Duany gave his design team at the Mississippi Renewal Forum in Biloxi in October of 2005. Duany was leading the Forum, which turned out to be an historic “charrette” to plan the post-Katrina rebuilding of 11 Mississippi coastal communities and three counties. Among Duany’s charges to his design team during the Forum was to come up with an alternative to the FEMA trailer that could become a building block to a real neighborhood. Why not use taxpayers’ enormous investment in temporary disaster housing to add value to recovering communities instead of future eyesores? The alternative had to be safe, capable of life in a storm zone. It had to be practical for long-term living. And it had to be so appealing that communities would welcome them into existing neighborhoods instead of zoning then out for fear of pulling down property values. One of the first answers to Duany’s challenge came from Forum architecture team member Marianne Cusato, who designed the now famous "little yellow house" at just over 300 square feet. 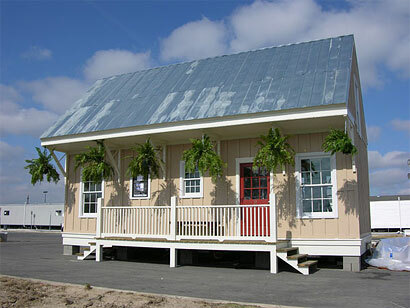 That design became the prototype Katrina Cottage displayed to raves at the International Builders Show in Orlando in January 2006. A couple months later, in Chalmette, Louisiana, where Duany was leading another charrette, the second prototype cottage -- a 700-square-foot panelized design -- got a similar reception. Since then, at least two-dozen Katrina Cottage designs have been produced, and more are on the way from the same group, most of whom were on the original Forum architecture team in Biloxi in October of 2005. There are already plenty of copy-cats. But if it’s not from this dedicated core group of designers, it's not a Katrina Cottage. Katrina Cottage II on display in the parking lot of a Wal-Mart in Chalmette, St. Bernard Parish, La. Photo by Diane Dorney. 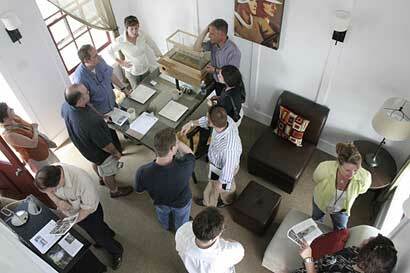 Visitors check out the cottage and speak to the designers. 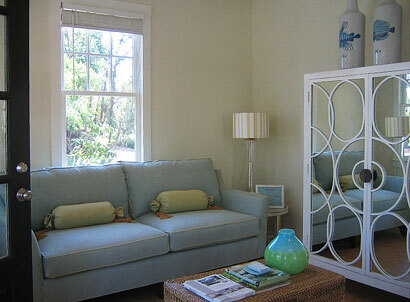 The Katrina Cottage design group distinguishes itself by key principles. Storm-worthy safety is foremost with these designs. But the architecture has to be right, so right, in fact, that potential customers able to spend more money for more space would opt for a Katrina Cottage instead (see the related report from a cottage manufacturing shop). And these models must offer the kind of variety and flexibility that enables then to grow from a “kernel” into a more expansive home on the same lot or to stand alone as a studio or rental apartment if a larger main house is eventually built. There is no one-size-fits-all Katrina Cottage. It is a family of designs. Cottage designed by Andrés Duany and built by Home Front Homes. Photo courtesy Duany Plater Zyberk & Co. The cottage on opening day. Photo by Matt Lambert. The original hope to use federal money to subsidize Katrina Cottages as trailer alternatives remains alive. Congress has appropriated $400 million for alternative housing models that are likely to include Katrina Cottages; but government wheels turn slowly. In the meantime, the designers behind the Katrina Cottage movement have concentrated on making an increasing number of authentic models available through a variety of private-sector sources, whether through plans for home builders or through certified manufacturing processes for factory-built cottages. 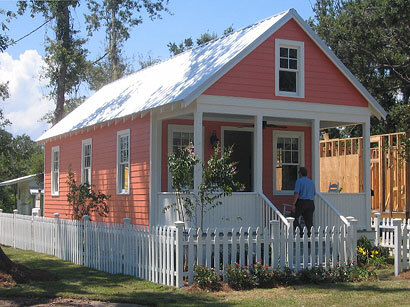 Lowe’s, the national building supply company, is introducing kit versions of four Katrina Cottage designs. Duany himself is partners with New Urbanist publisher Diane Dorney in property in New Orleans where the two will locate New Orleans vernacular Katrina Cottage models in an historic district. A Cottage Square going up in Ocean Springs, Mississippi, will display some 23 models, including Cusato’s original prototype, so that property owners can examine the variety of styles and sizes and order the home they want on the spot. The Salvation Army is considering a Katrina Cottage cluster for property it owns in Gulfport, Mississippi. And the federal government is looking at a Katrina Cottage-style approach for housing at Jackson Barracks near New Orleans. Almost every day, some new idea for a cottage community or a new design approach bubbles up. Interior of a cottage at Cottage Square. Photo by Samantha Bearden. The horizons for Katrina Cottages have expanded far beyond the storm zone. 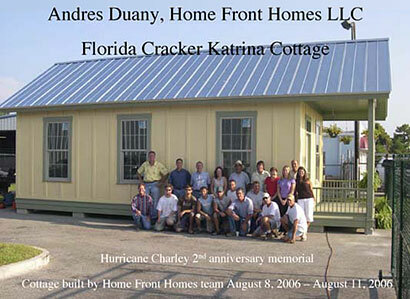 Home Front, the Southwest Florida-based company producing panelized versions of Katrina Cottages, in August introduced a Florida Cracker-style model that can be erected in a week. In October, USA Weekend magazine and the Congress for the New Urbanism are partnering with local and national groups to design a mid-Atlantic Katrina Cottage model and give it away to a family of displaced storm victims in the region. It’s apparent now that the movement has the potential to address more than just disaster housing. That’s a worthwhile goal. It could be that best thing that’s ever come out of a national disaster. 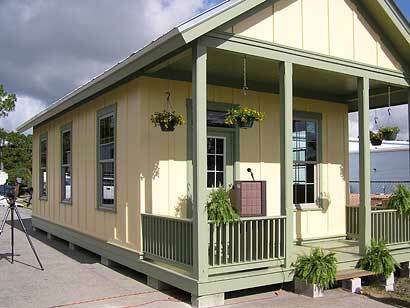 Manufactured housing factories are gearing up to produce Katrina Cottages for the Gulf Coast. Architect Steve Mouzon visited one factory to make final design revisions, and he reports on progress there.